The organization has pulled in around $300K in donations since the fire, and already has a new home. It's been a whirlwind week for the Community Food Sharing Association — from ashes to new beginnings. 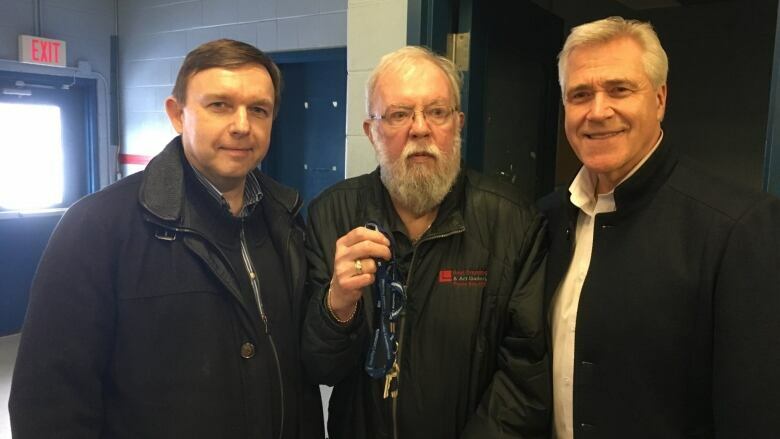 The food bank distributor got the keys to its new home Friday afternoon, an empty warehouse in St. John's belonging to the provincial government. Premier Dwight Ball commended CFSA manager Eg Walters for his work with the association. "You've been doing this for a long time and you're a big part of this," he said. "We just want to give you a safe place to be, and get in [at] no expense to you." Walters thanked Ball for the government's help – $50,000 cash on top of the warehouse – then turned to reporters. "You know, they're not doing it for us," he said. "They're doing it for mom and pop and the kids who go to food banks across the province. And [they're] the big beneficiaries of what the province is doing today." 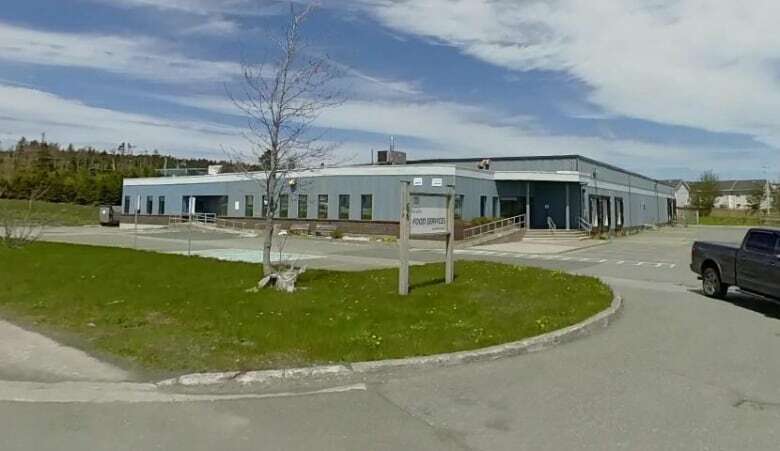 On top of a new home, the association has also received around $300,000 in donations, said Walters, after an electrical fire wiped out the stock at its main warehouse on Topsail Road in Mount Pearl on Wednesday. The CFSA supplies 54 food banks across Newfoundland and Labrador, and there has been an outpouring of support from businesses and organizations throughout the province. "I'd like to say a great big heartfelt thank you to all the supporters of this project," on behalf of everyone who uses and volunteers in food banks, Walters told The St. John's Morning Show. There's still lots of hard work to be done, he added. They have to remove all their equipment from the burnt building, have it serviced and move it over to the new digs on Pippy Place. "Really, you're setting up a whole new warehouse situation and that's a logistical nightmare, but we'll handle it for sure." Walters urged communities to hold an extra food drive for their local banks as the association rebuilds. Jody Williams might be surrounded by a wealth of pasta, beans and cereal, but he's already planning for scarce times ahead. The manager of St. John's largest food bank, Bridges to Hope, said the steady flow of goods from the former CFSA warehouse to his shelves likely won't resume for a while. "It's a huge loss," Williams said Thursday. "I still haven't figured it out yet." About one-fifth of his food bank's supply comes from the association, he said. In real terms, that 20 per cent deficit could mean dozens of families don't get help, or many more receive less than they normally would. "We're the busiest food bank in the city. We feed probably about a thousand people a month," he said, noting that the number might soon grow: Williams fears smaller food banks, which depend on the association entirely, may temporarily shut down depending on how long it takes the CFSA to move. "No clients go there," he said. "They're a warehouse, so we actually will see the effects of this." "I am starting to mentally prepare for us being much busier next week," said Williams. Williams is impressed by the community's reaction. "Hunger is a community problem and it kind of takes a whole community to put this back together again," he said. Even at other food banks around N.L. that try to be self-sustaining, the CFSA serves as a vital support. The network is a "backup plan" at one Botwood food bank — which has its own partnership with a food wholesaler — according to Amy Ralph, chair of the Botwood Interfaith Good Will Centre. "They're our insurance, they have our back," she said. "We run out of food, pick up the phone, food is on the way." Ralph said the CFSA was a big supplier for the food bank for years, before they reached a deal with a wholesaler from Grand Falls-Windsor. "It gives you peace of mind, it's assurance." 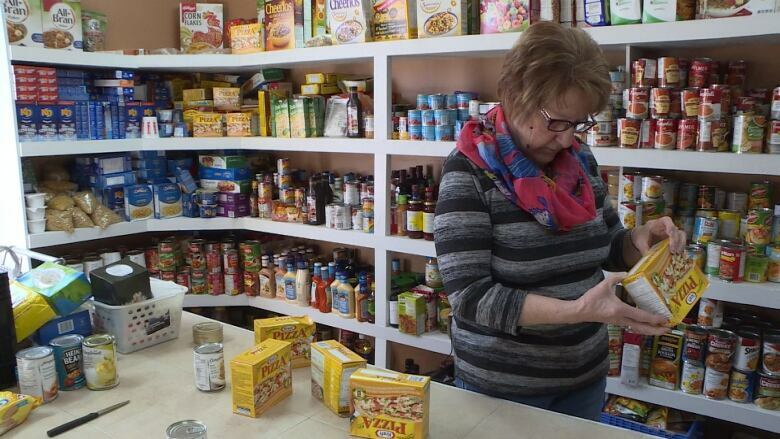 A sister centre in Lewisporte — the Lewisporte Interfaith Goodwill Centre and Food Bank — works to earn its own money through an attached thrift store. According to treasurer Joy Freake, the store brought in about $15,000 last year. The centre also has partnerships in the community, but even then, it goes back to the CFSA for help. "Around Christmastime we do very well, throughout our community and organizations and food drives," said Tracey Dawe, the director of the Lewisporte food bank. "However with February and March coming up — which is the hardest months on food banks and food drives — we would have been availing of them again." Dawe says her group gets "tremendous" support from volunteers and community groups, and she says she's sure the community would step up if the centre was forced to make a call for donations.